Many people have the opportunity to visit our territories and taste the magnificent wines they offer us, first of all the Sagrantino. Imagine going back to the origins of this wine and be able to relive the feelings of the past. 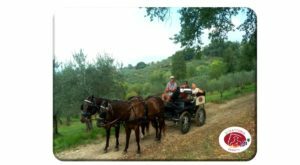 With the carriage you slower and relaxing, you can fully enjoy the magnificent landscapes accompanied by the clatter of horses, To identify with growers who carry grapes with their animals to the cellar and relive the emotions of the past. We would also have the same destination, but to taste the wines, salami and cheeses. An experience to do in any season, from the spring where you can see the green vegetation reborn, to autumn until where the vineyards with their beautiful colors, yellow and red, color the Surrounding hills. Why not! On some beautiful winter day where the sun with its warmth together with a glass of Sagrantino will heat our bodies. Visit some of the most beautiful wineries or villages like Montefalco or Bevagna in a carriage with two horse is an experience not to be missed.